The Visible Change in Children’s Programs — The Scripture Says…. These are great! Each one is short, about 13 minutes, but perfect! The story is so easy to follow for my son (3 years old)…and Mr. Fixit makes practical application of all the bible stories to real life. I love the young actors too, they are what American children used to be… respectful and eager to learn about the Lord. Great investment! Thank you for the wonderful suggestion! I am writing from Brazil. 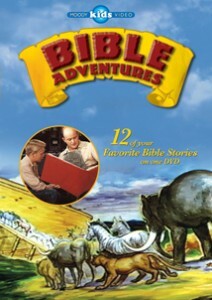 I have used this DVD to tell Bible stories to my son since he was 1 year old. Now he is 4 and we still love to watch the stories together. Great material, faithful to the Bible, and I appreciate the fact that it is not sophisticated. This old-fashioned stuff is just what we need, it makes it easier to keep the focus on the message.